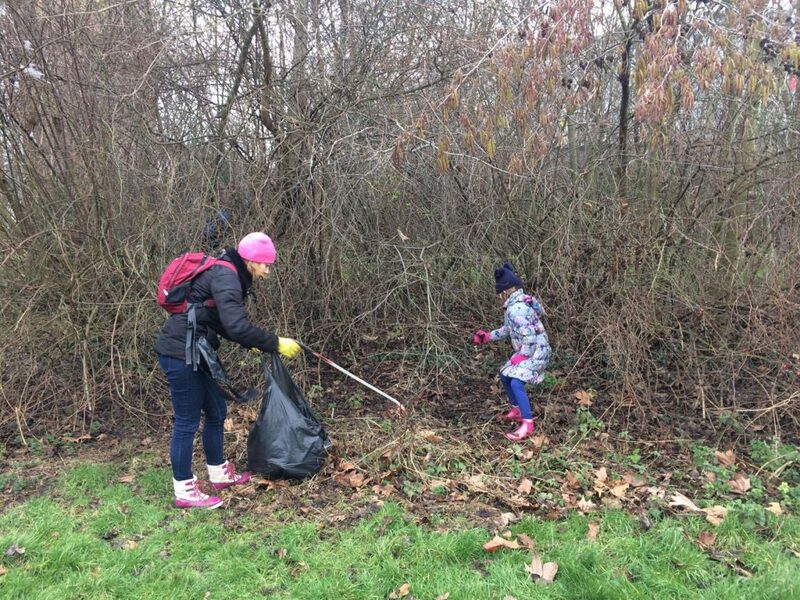 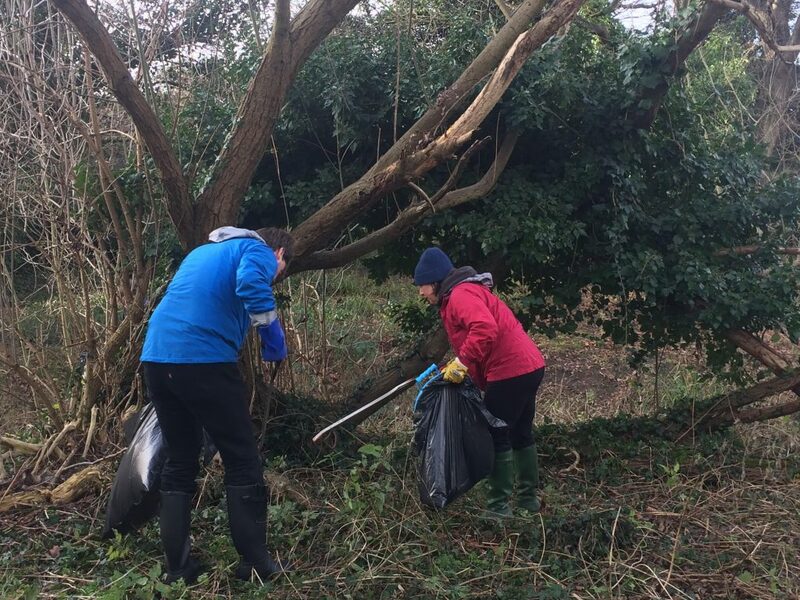 For the last cleanup of 2018, we headed to King George’s Park in Wandsworth. 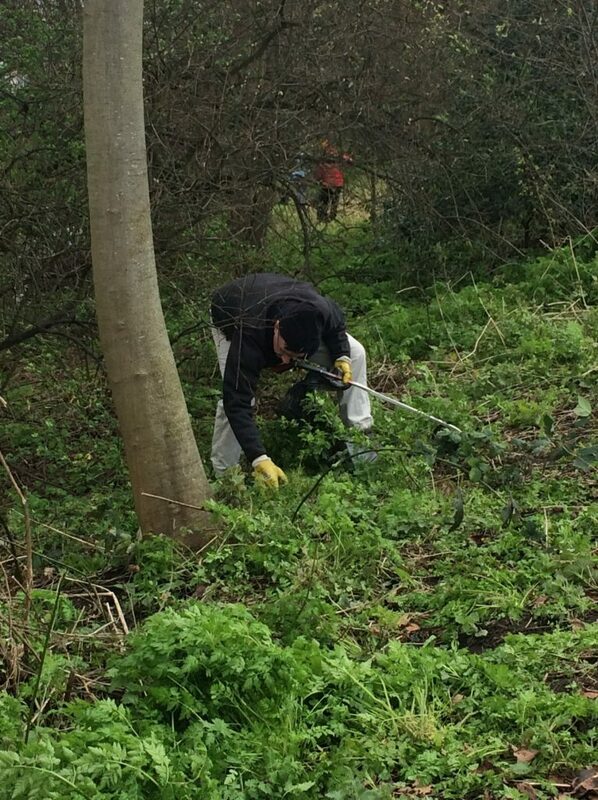 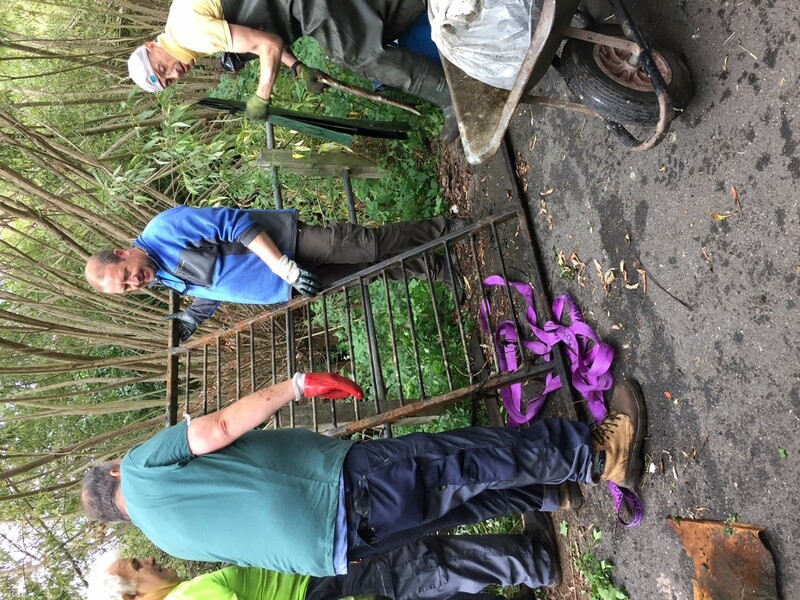 This was our first cleanup funded by our fantastic new funders the Big Lottery. 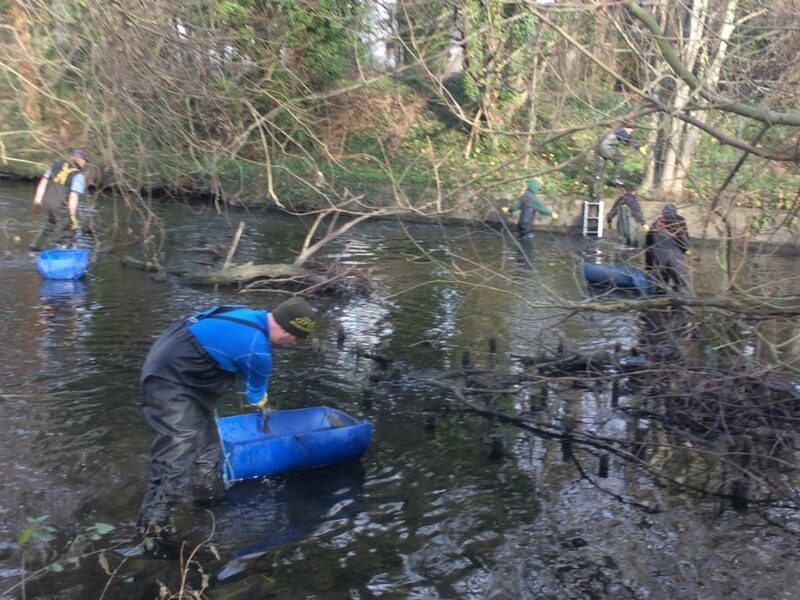 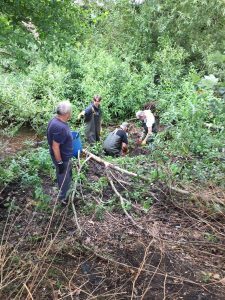 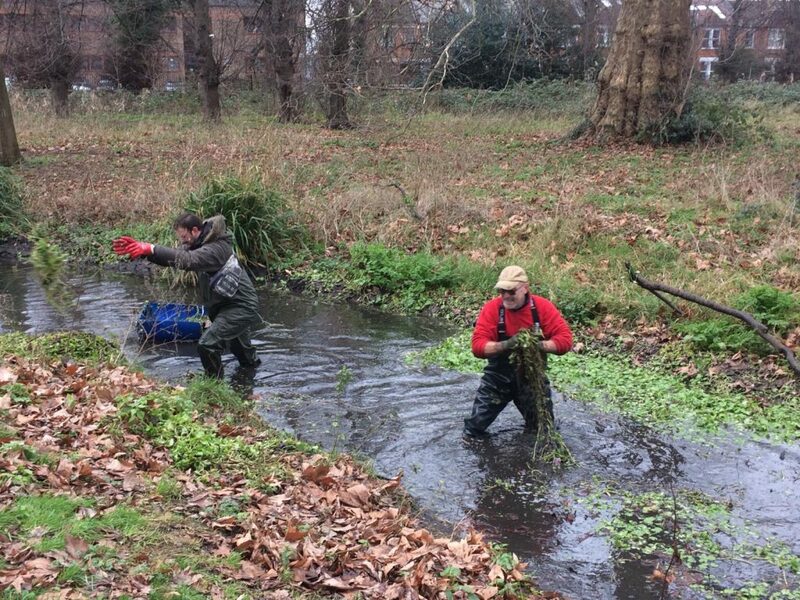 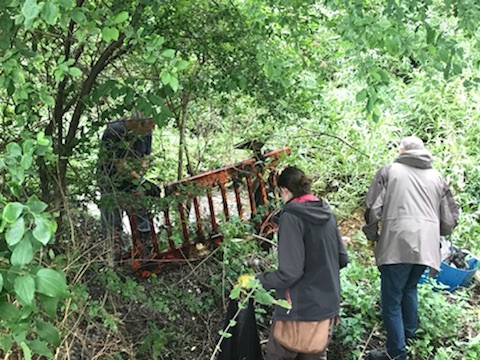 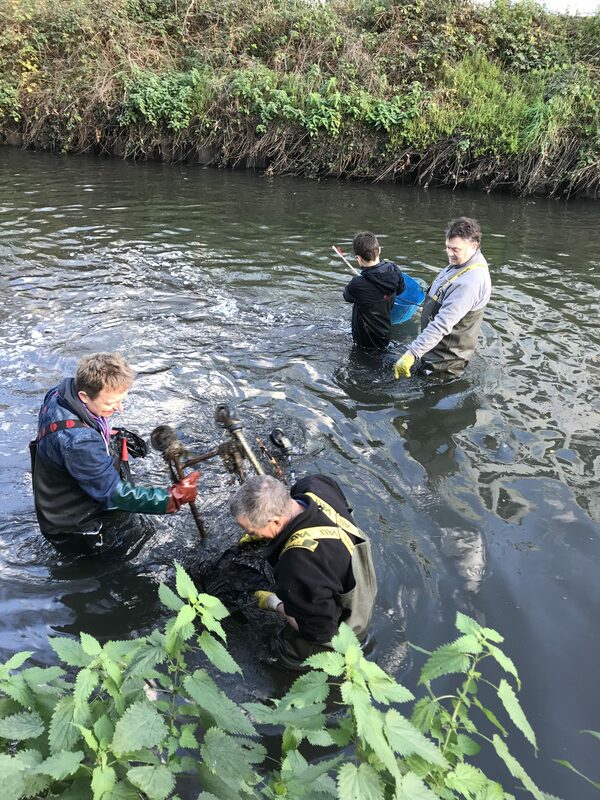 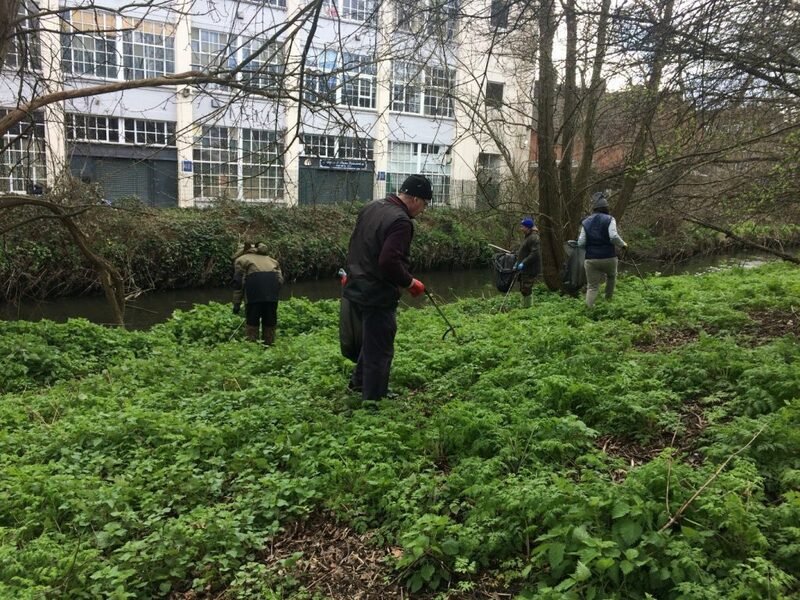 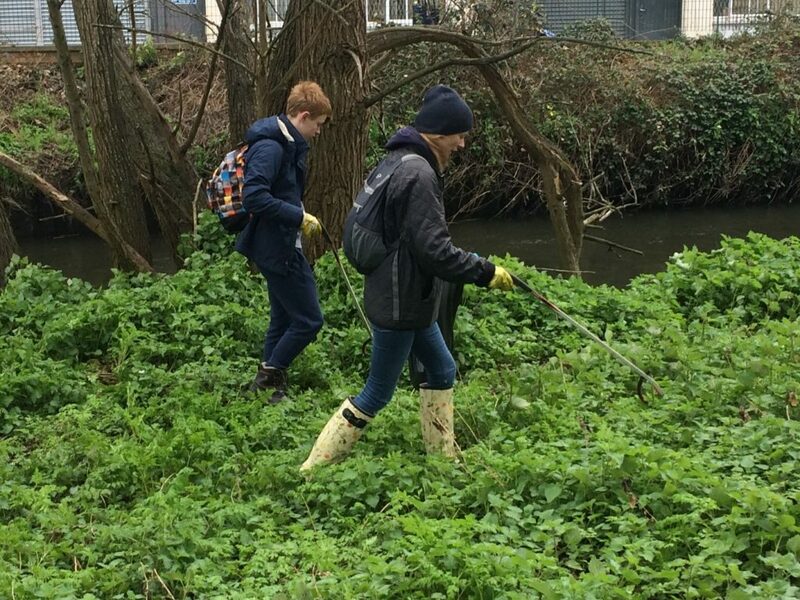 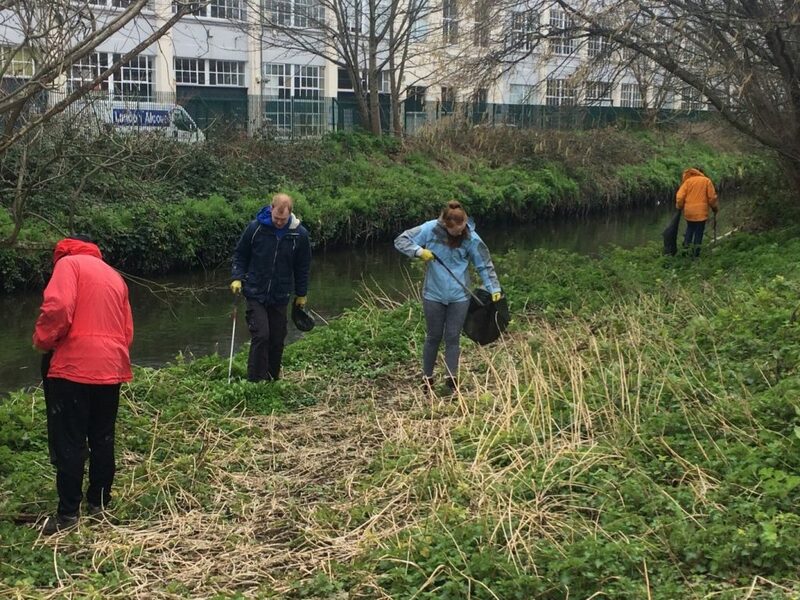 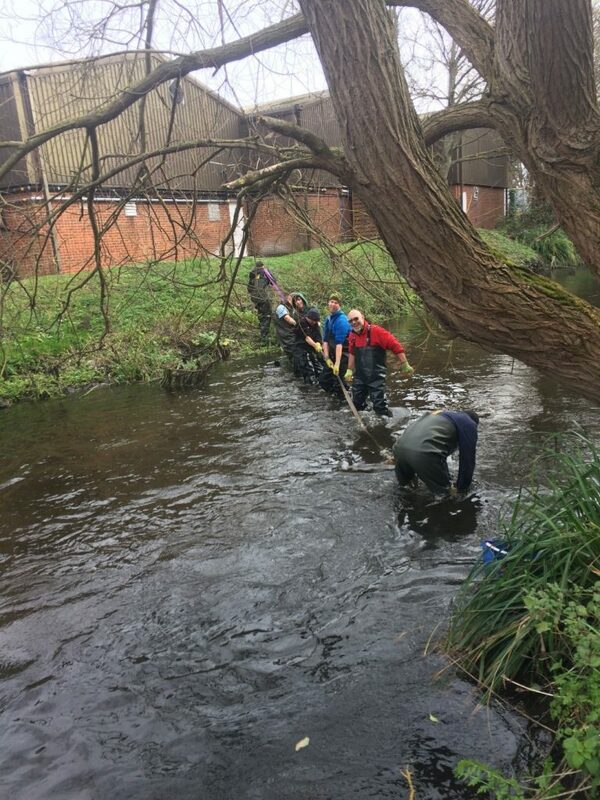 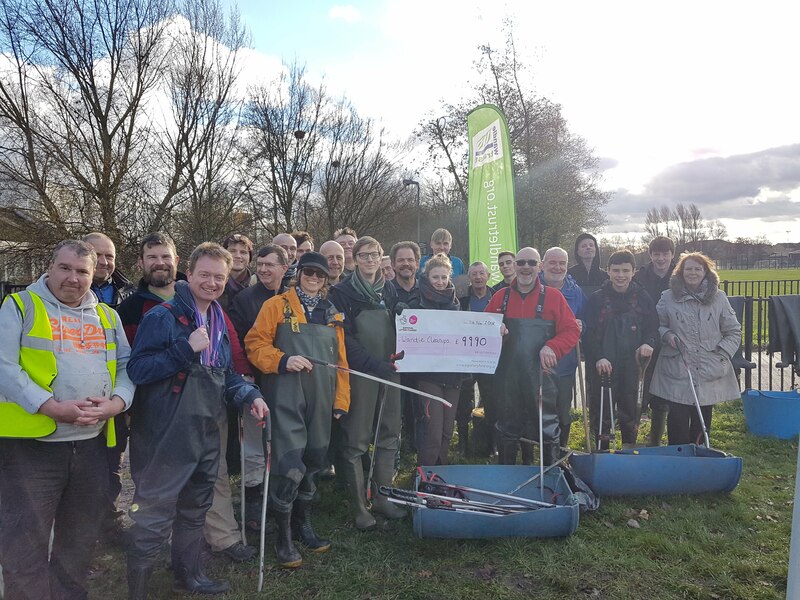 Thanks to all the players of the National Lottery that make funding great projects and activities like our Wandle cleanups possible. 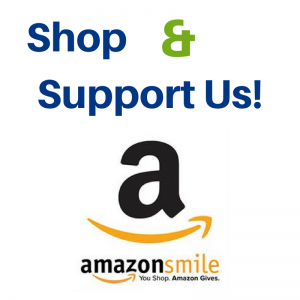 We couldn’t do it without you! We started off the day with the usual Welcome Talk and Health & Safety briefing. 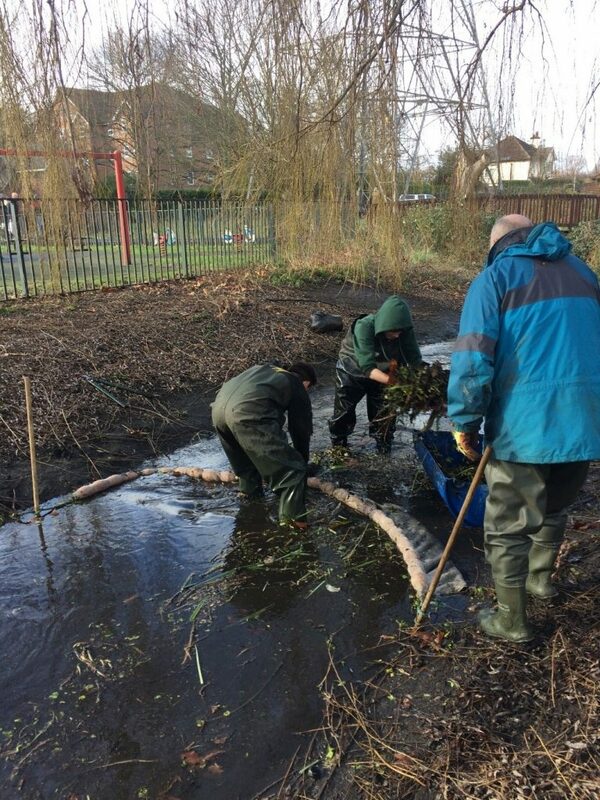 We then cracked on with wading and litter picking around the banks. 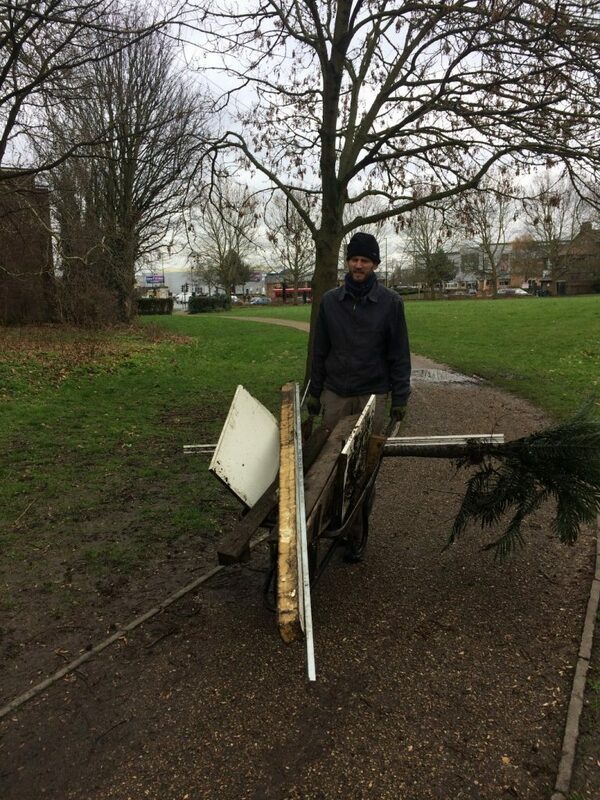 Despite the windy weather, we had 31 merry volunteers – so thank you to everyone who managed to make it at this busy (and cold) time of year! 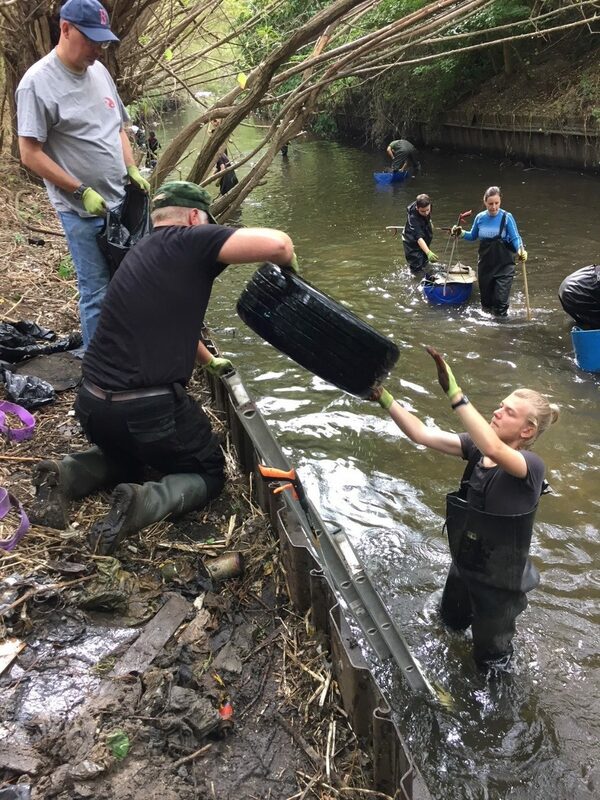 We removed as much litter as possible from the river, getting to all the tangled plastic bags in the river bed and surrounding vegetation. 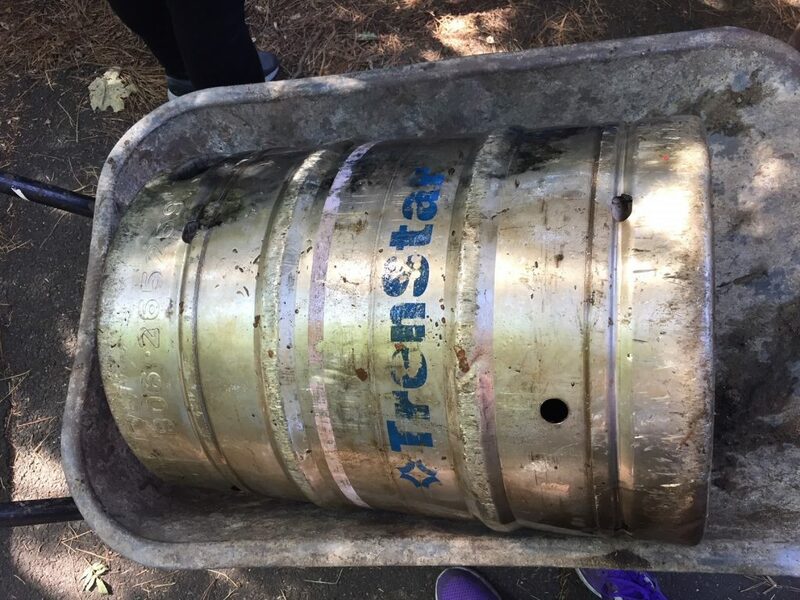 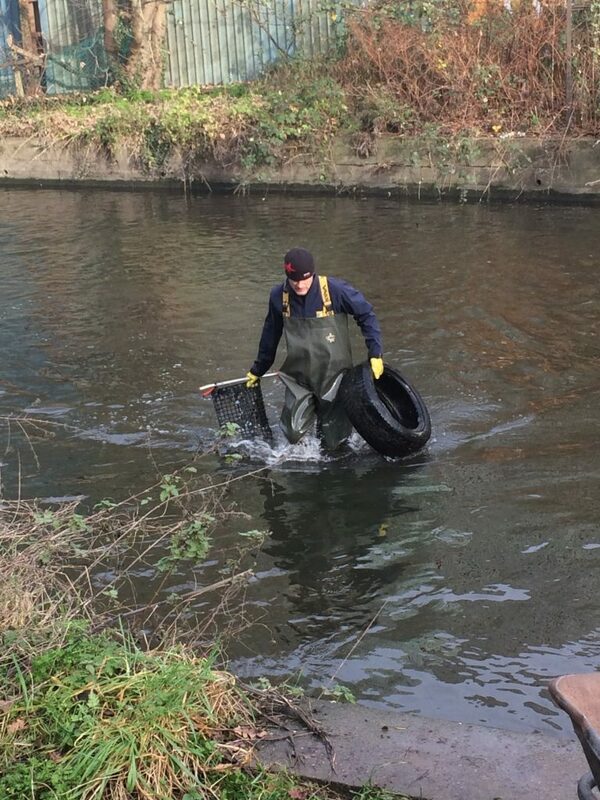 We found a trolley filled with empty cans that had been dumped into the river and pulled that out easily. 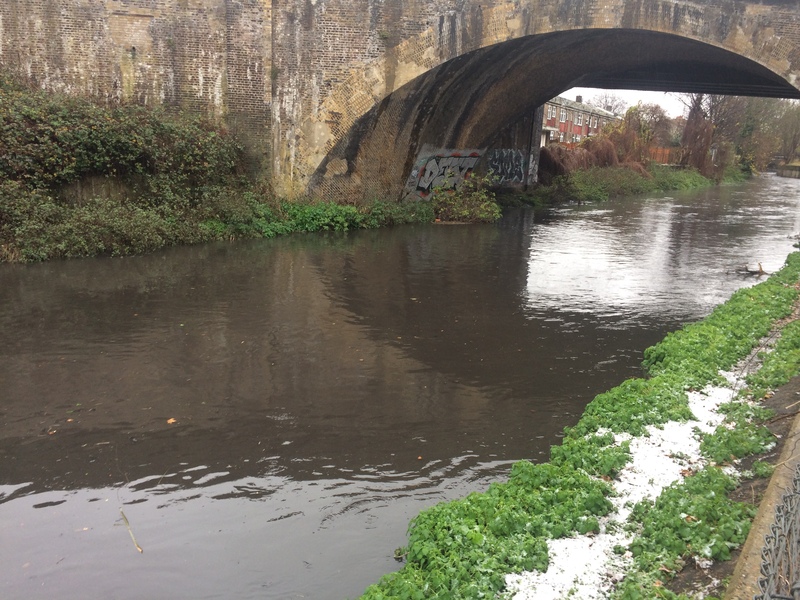 We stopped for lunch around 1pm and enjoyed some well-deserved mince pies and other Christmas cakes. 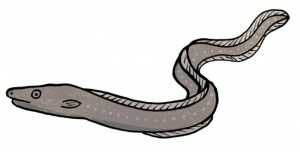 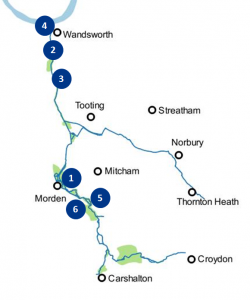 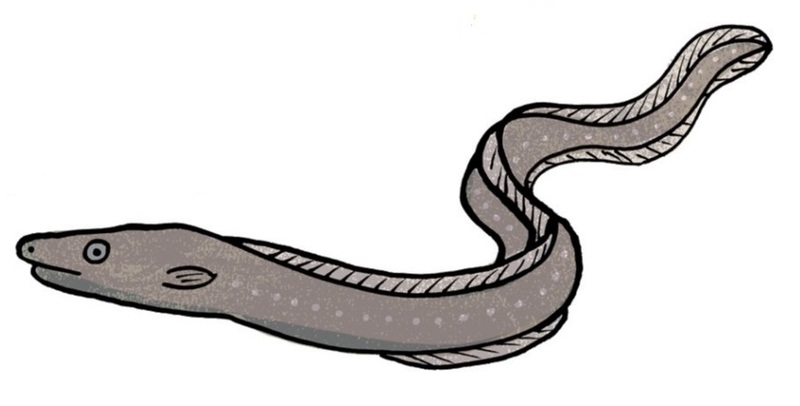 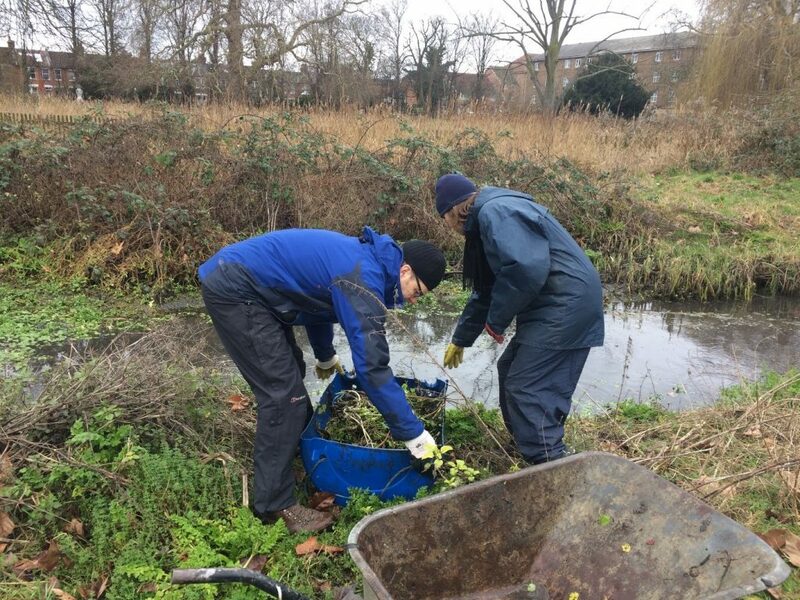 We also squeezed in a Christmas Wandle-themed quiz, reflecting on the good work throughout 2018! 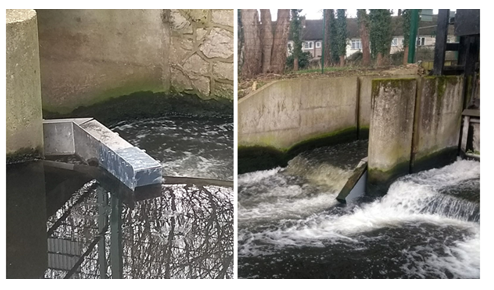 We couldn’t wade much further downstream after lunch as the river was too deep and fast-flowing. 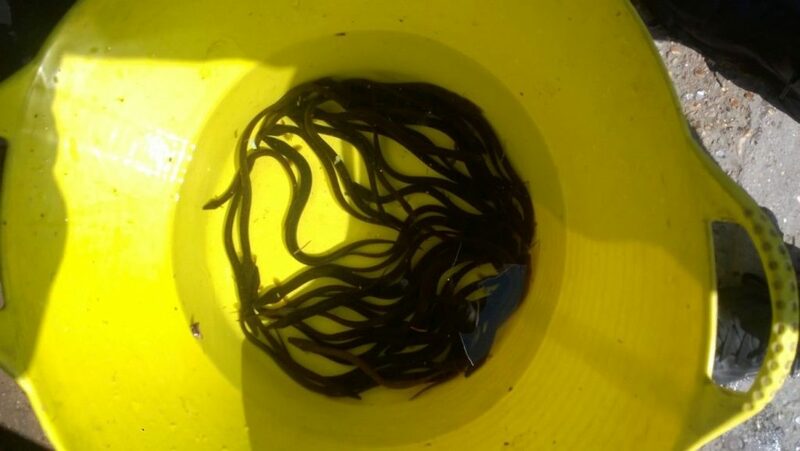 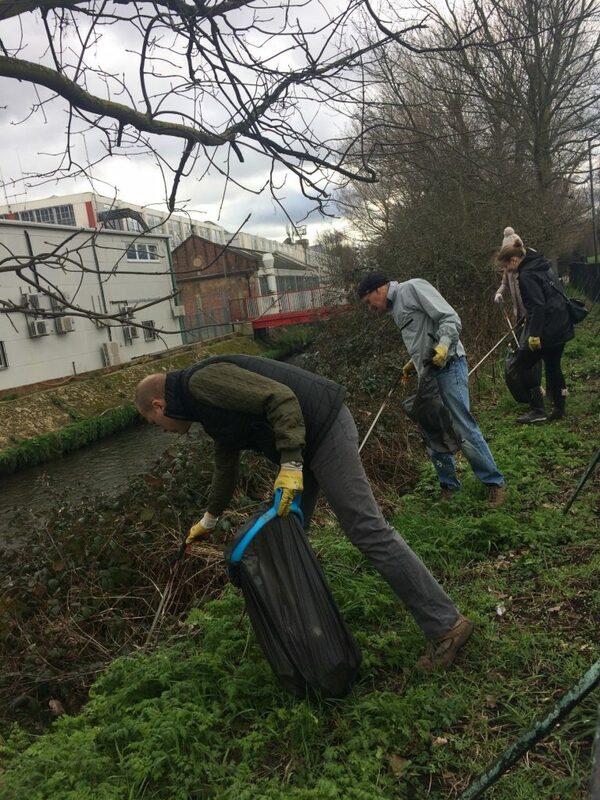 Instead, we did a second sweep of the river and found more rubbish that the river had uncovered since our first sweep. 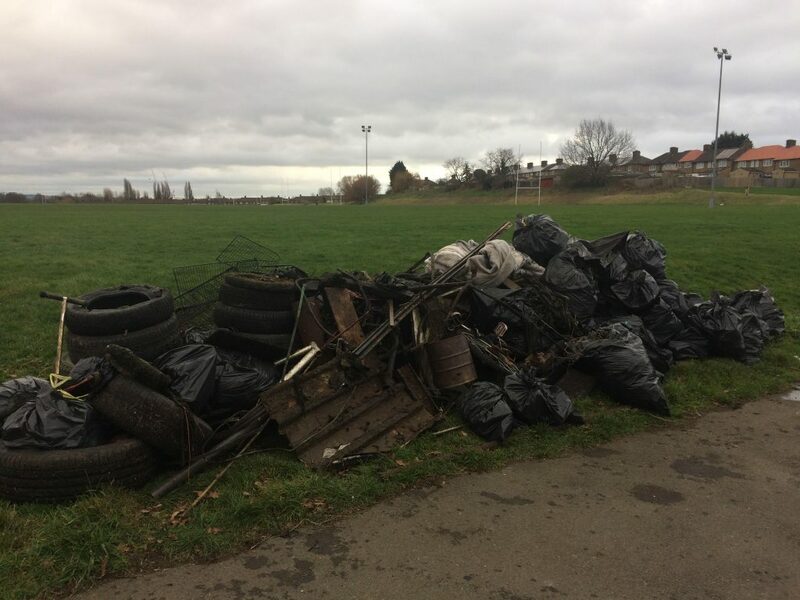 It was getting a bit too chilly and there wasn’t much left to litter pick, so we finished early and headed home for Christmas. 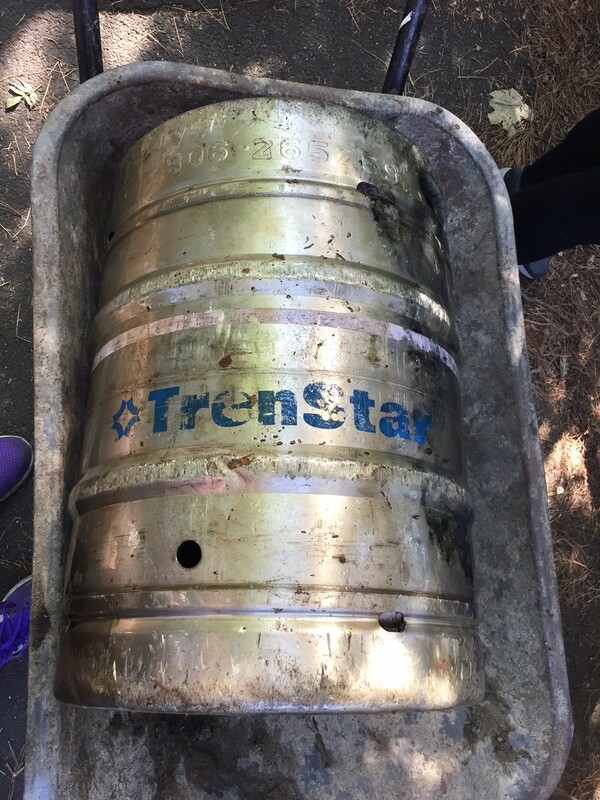 So what did we find? 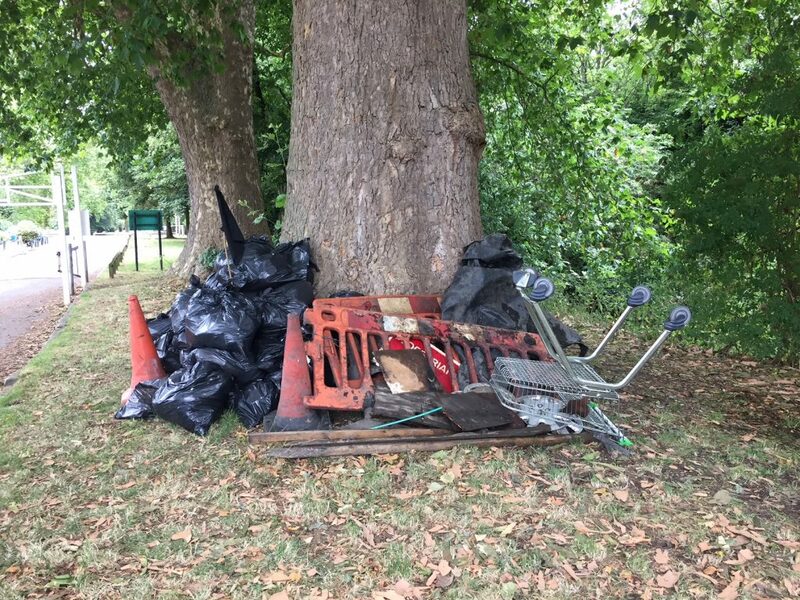 2 tyres, 2 mattresses, a trolley, a pushchair, an old kettle, a wooden pallet, 2 footballs, a traffic cone, lots of bottle, cans and plastic bags. 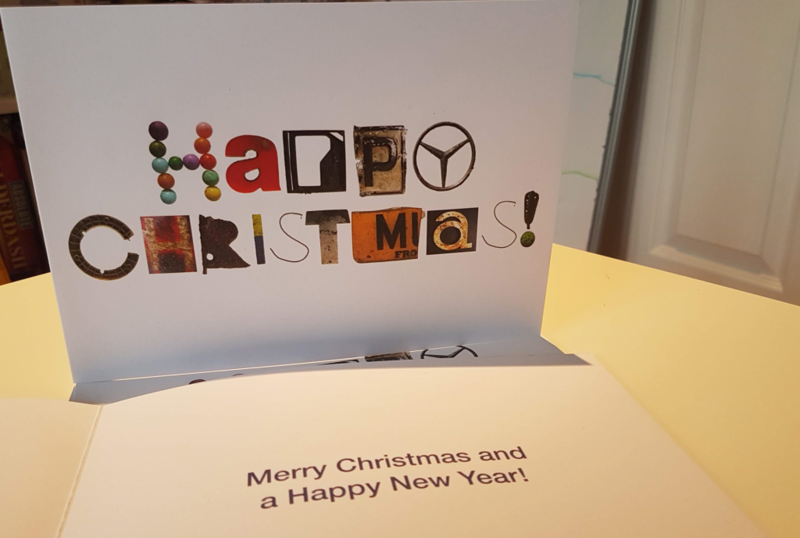 I’d like to wish you all a Merry Christmas and a Happy New Year and I look forward to keeping up the great work with everyone in 2019! 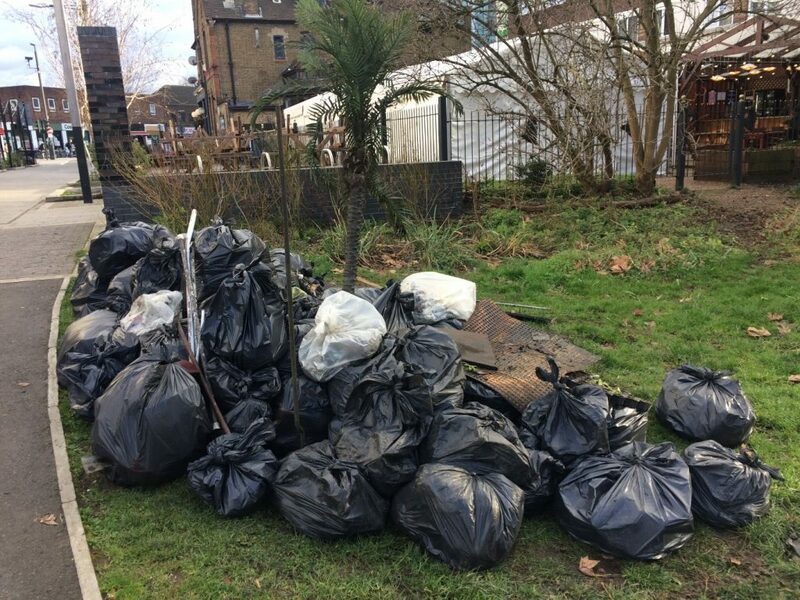 Huge thanks to everyone who helped unpack and pack up the van during the event (in particular Dave, Joe and Chris), Rosie and Wally for supervising the Event Tent, Wandsworth Council for organising collection of all the rubbish the next day, Big Yellow Wandsworth for providing free storage space for our equipment and to our funders, the Big Lottery. 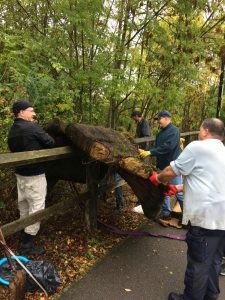 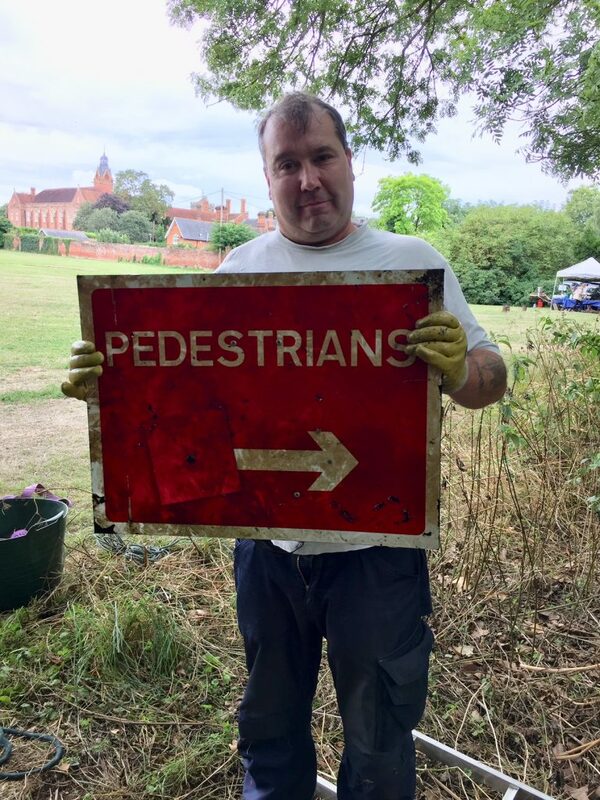 Thank you to all our volunteers for coming: Charles, Michael, Victoria, Thea, Jonathan, Rosalie, Ed, Joe, Phil, Dave, Paul, Jenny, Nick, Jason, Kesra, Rose, Andy, Eddie, Chris, Martin, Per, Phil, David, Steve, Korab, Wayne, Jane, Simon, William and Guy. 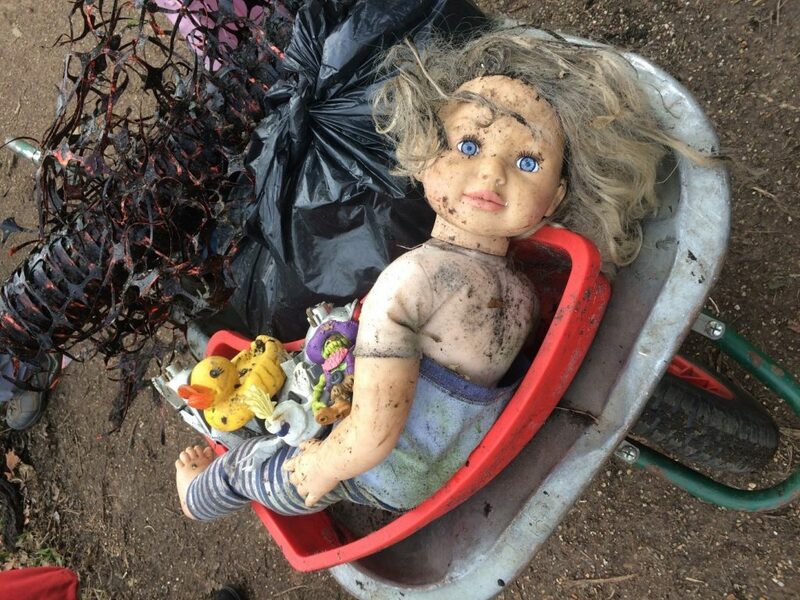 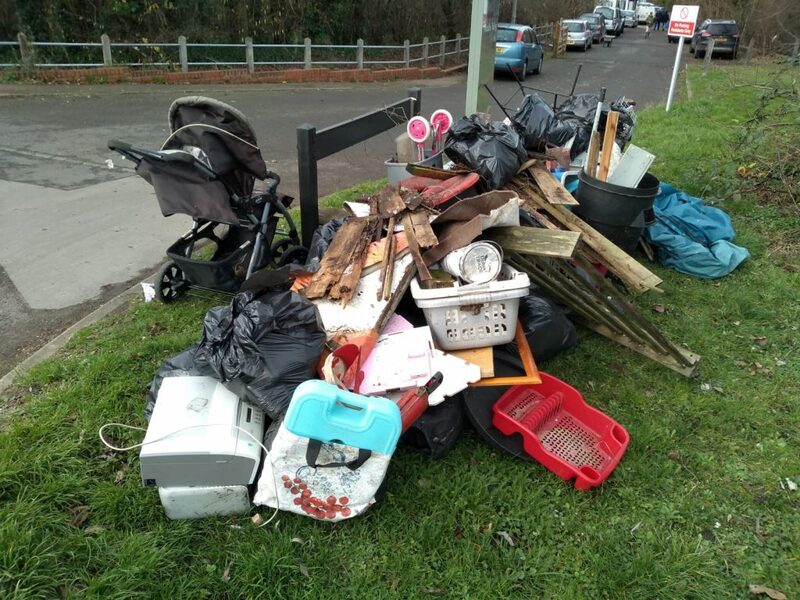 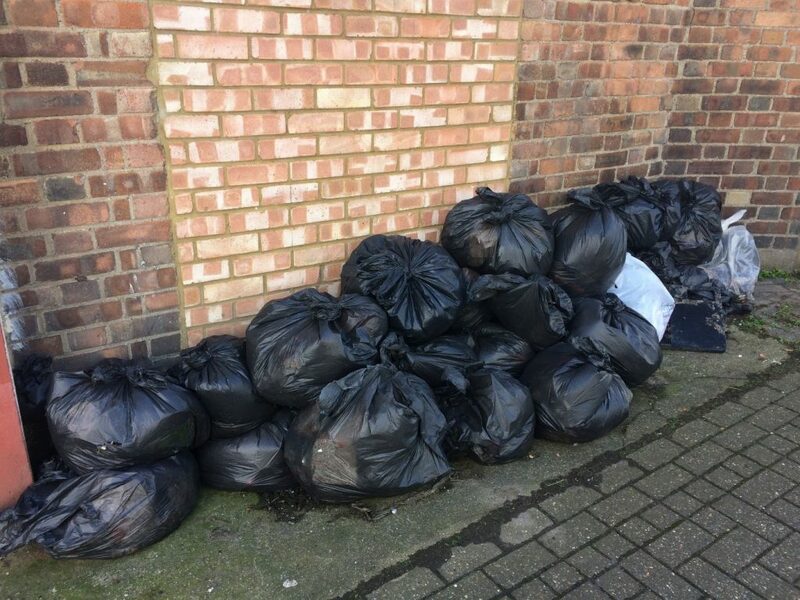 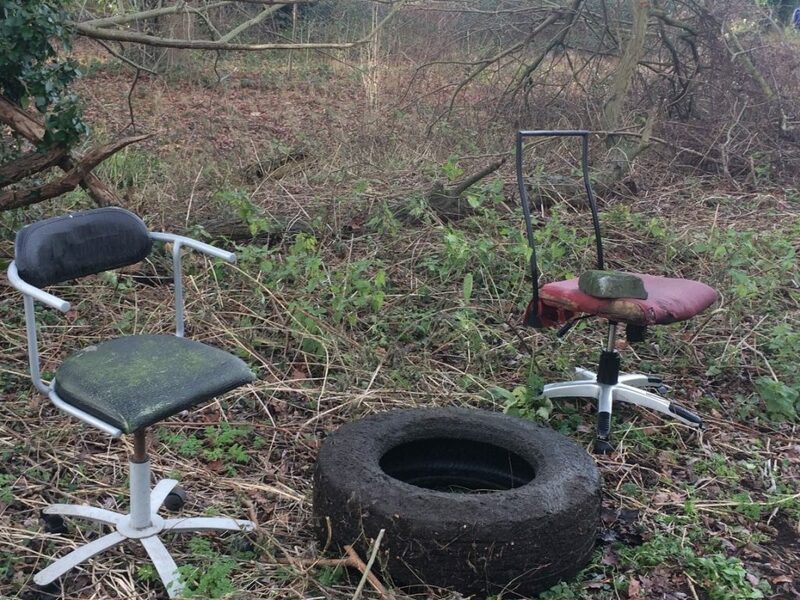 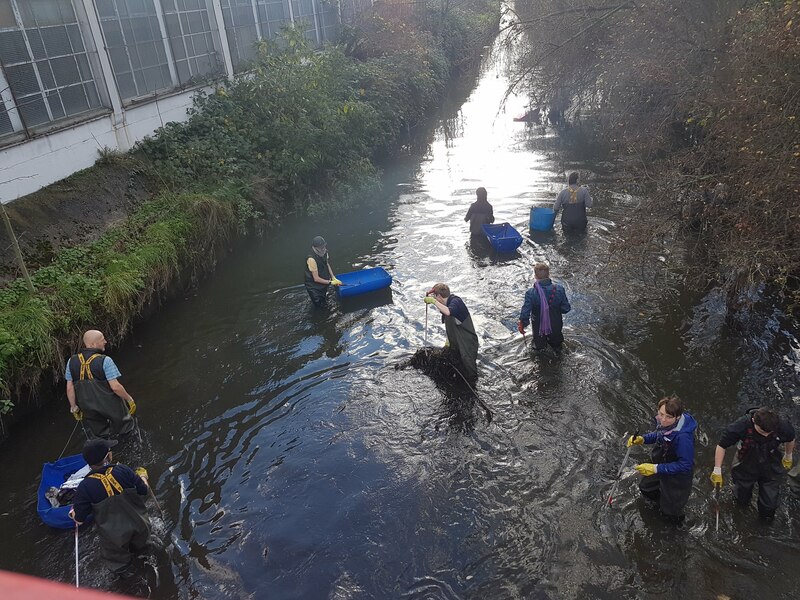 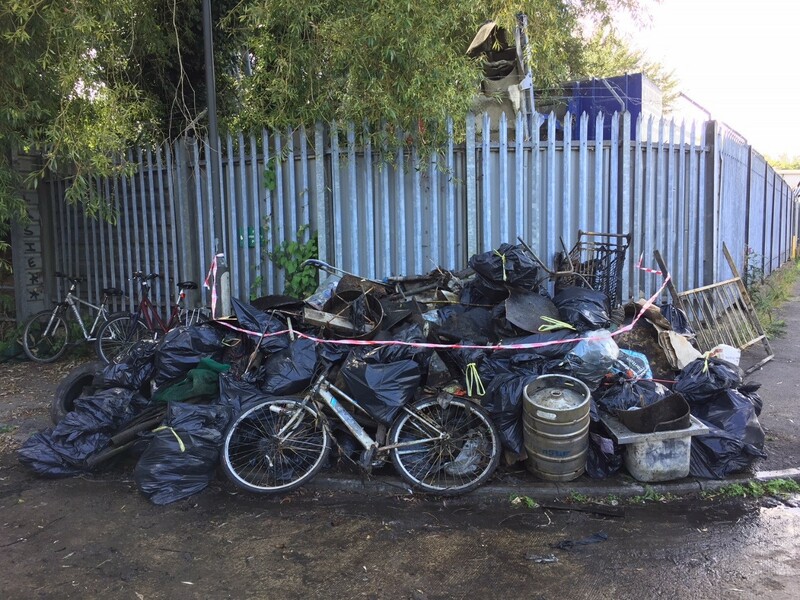 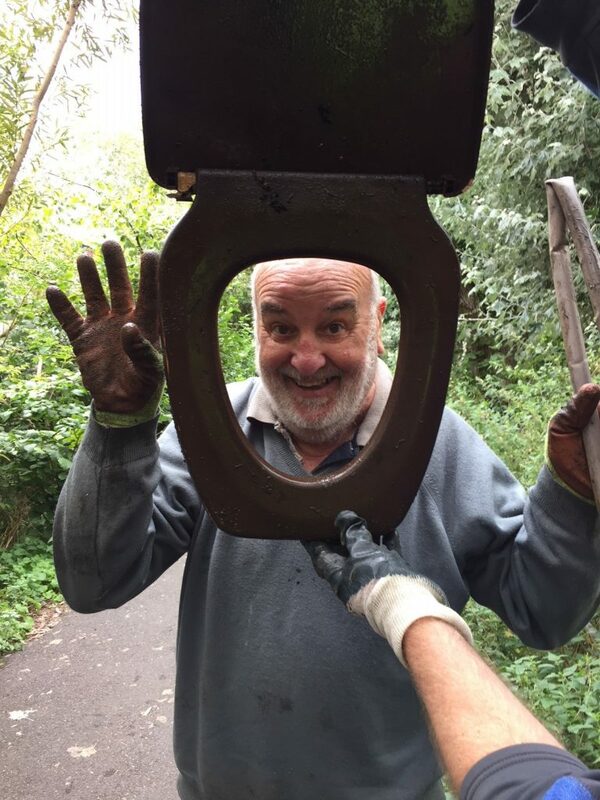 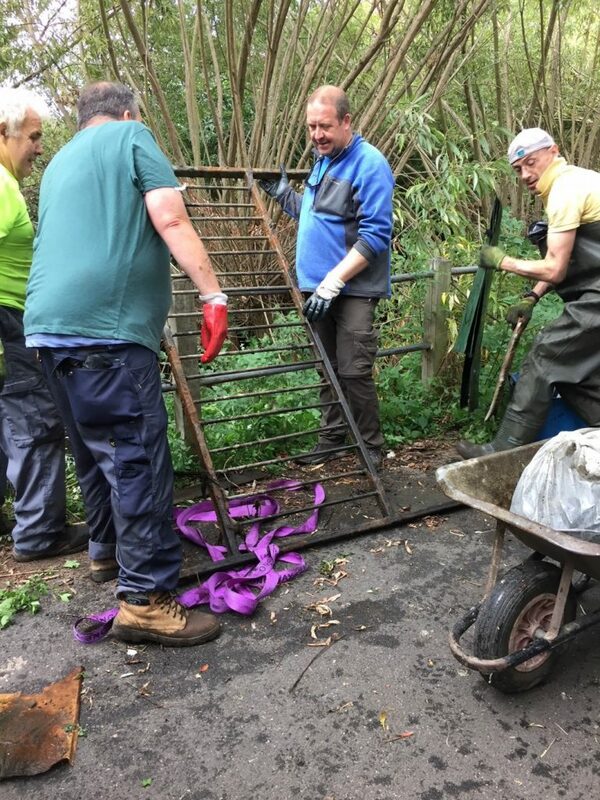 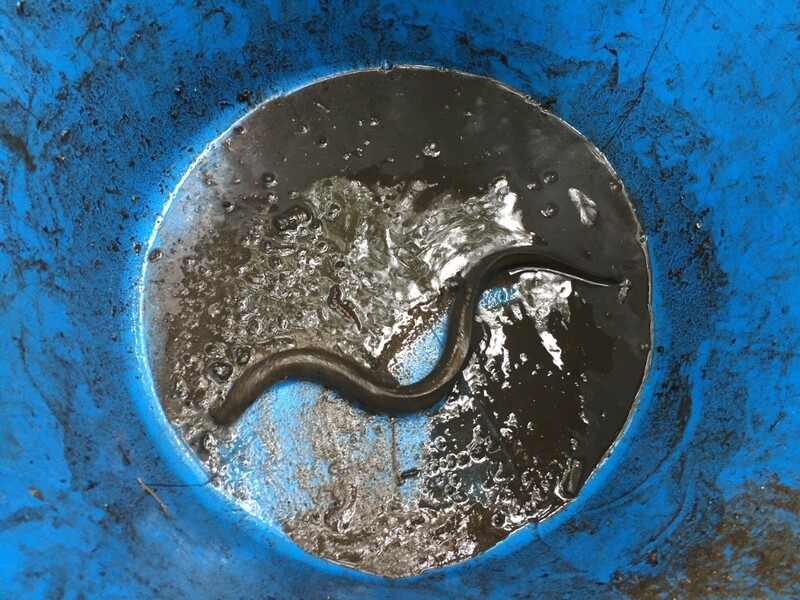 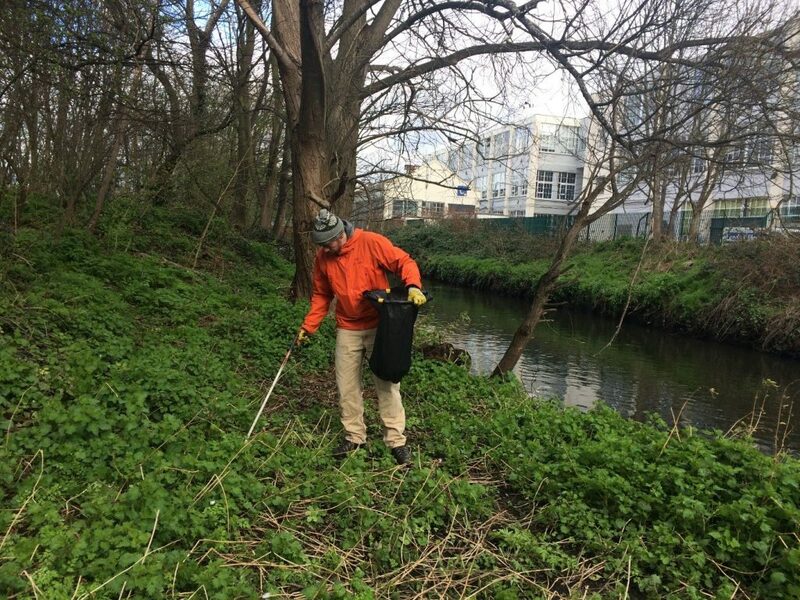 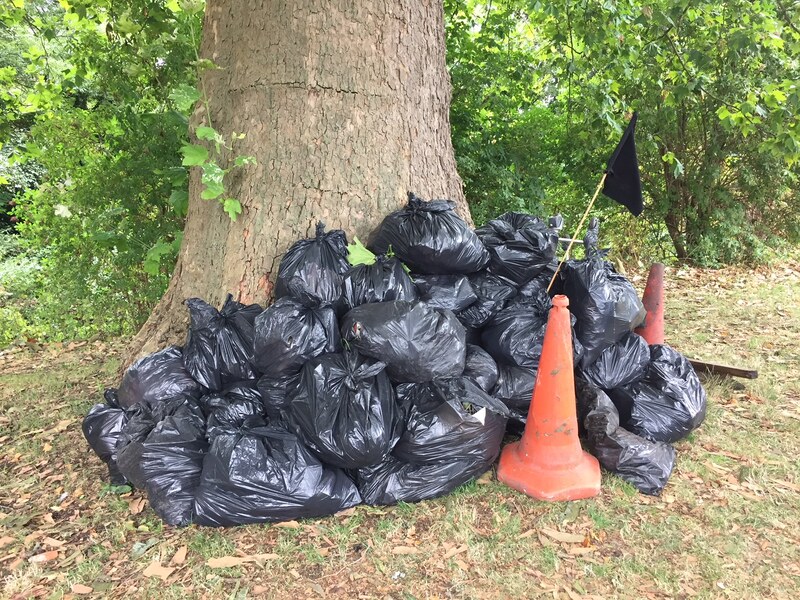 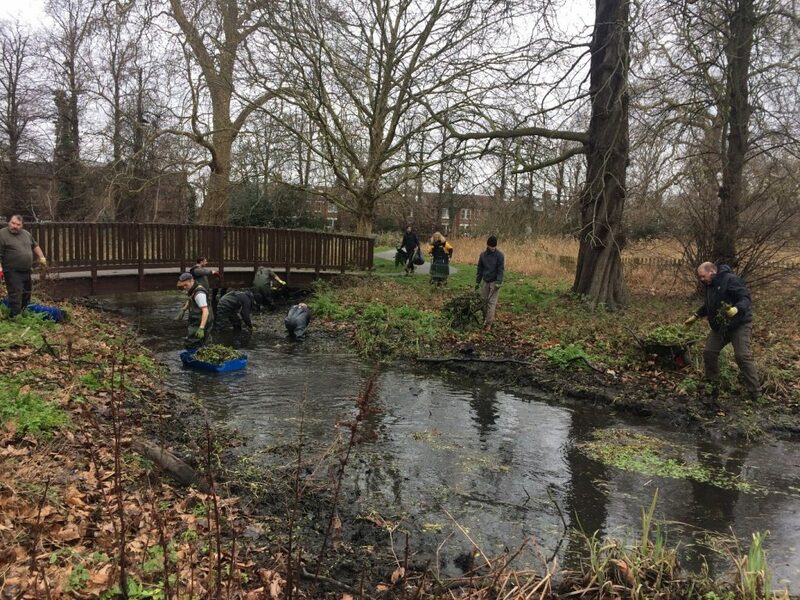 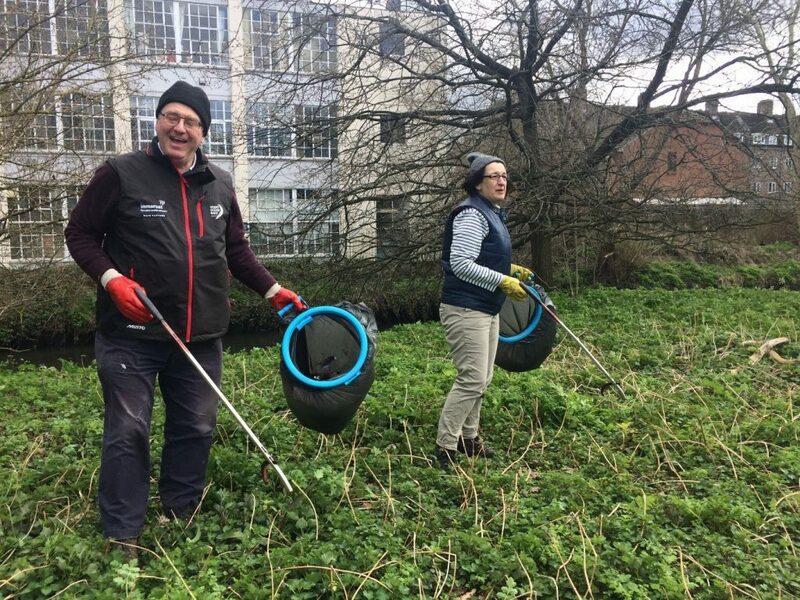 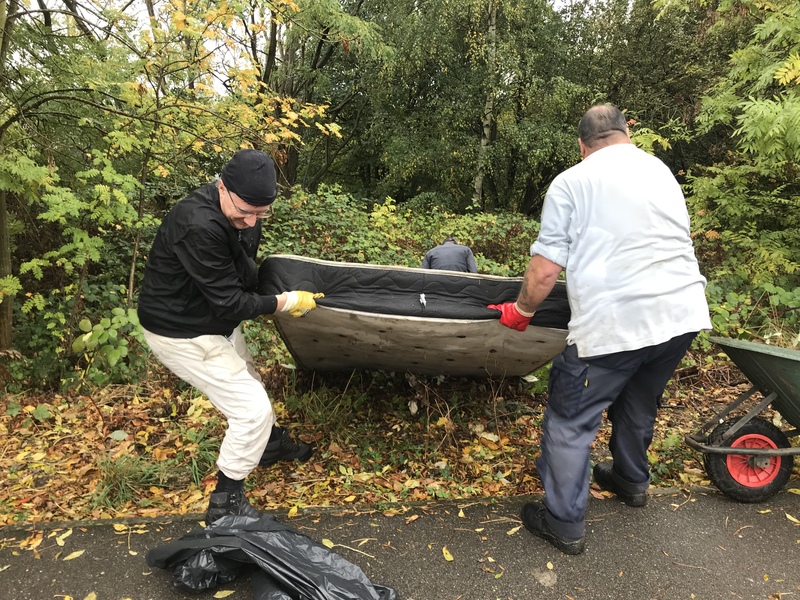 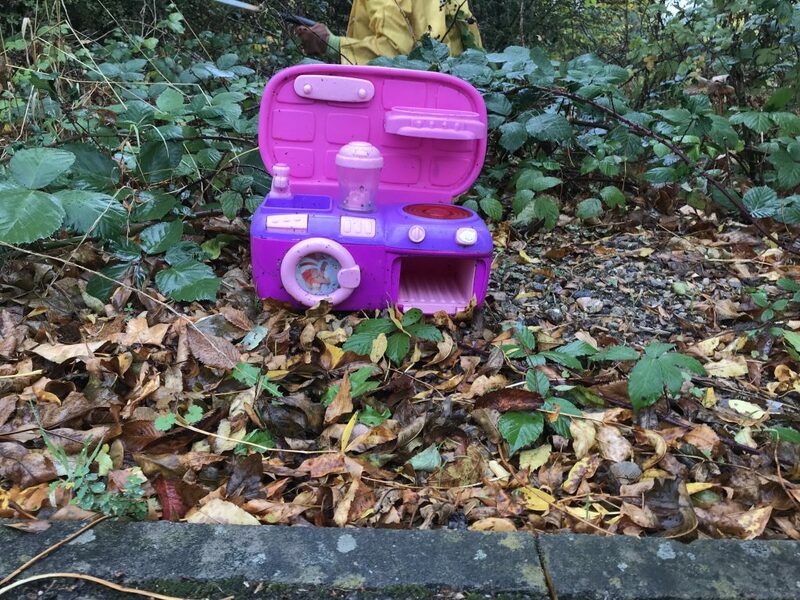 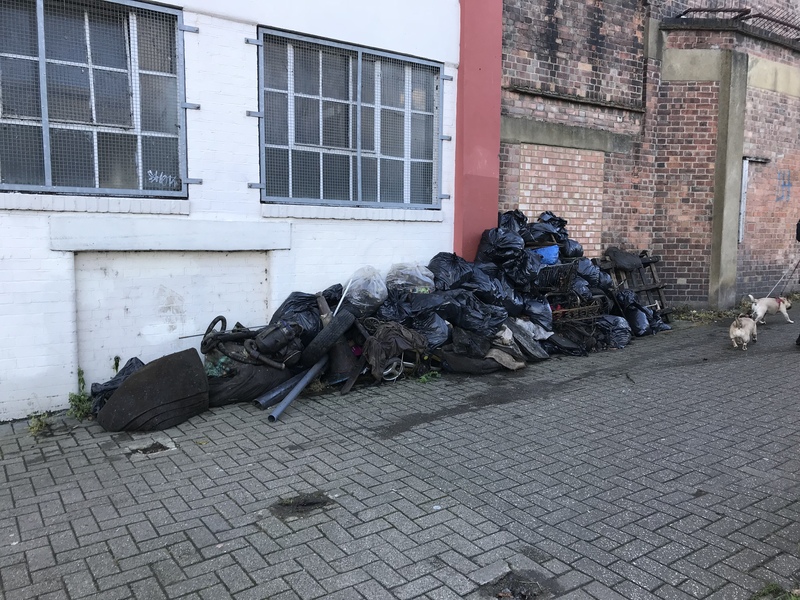 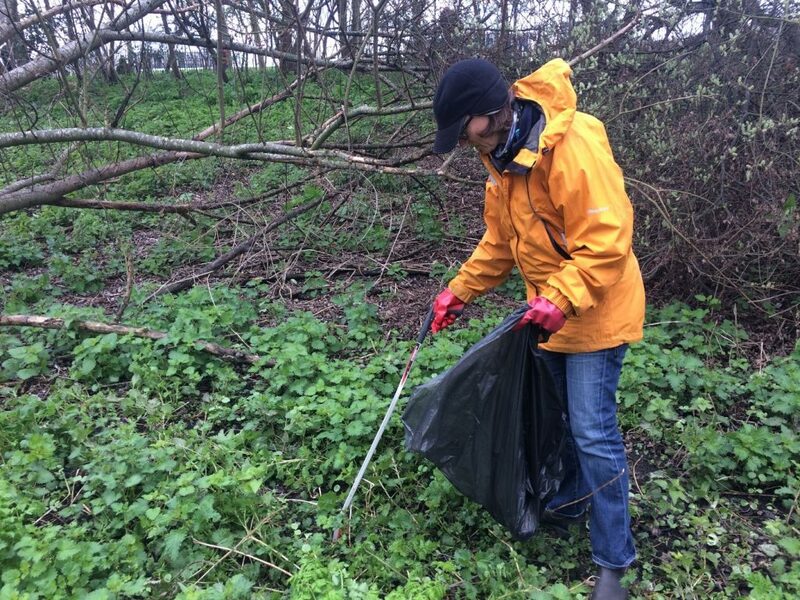 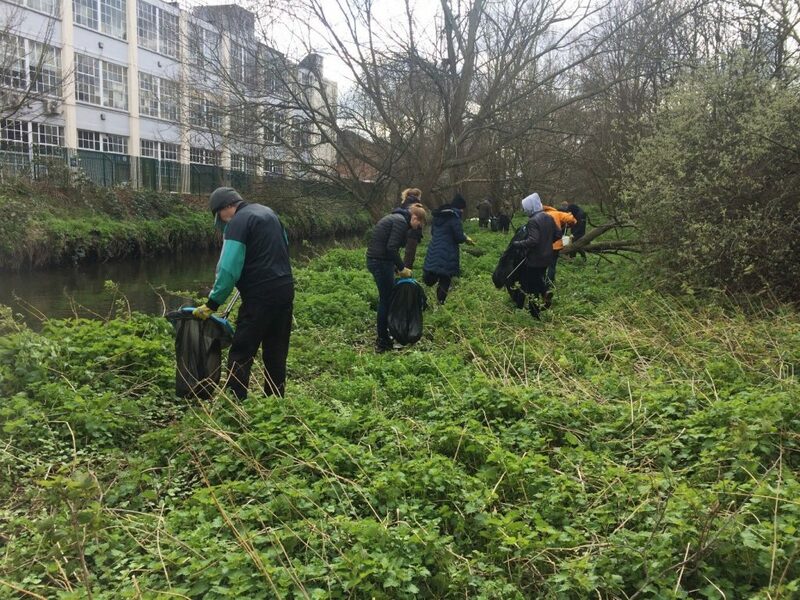 This entry was posted in Cleanups and tagged Awards for All, Big Lottery, Christmas, Cleanups, Events, National Lottery, Spreading the Wandle Word, Volunteer, Wandle, Wandsworth on December 20, 2018 by Jess Mead.